This weekend marks the National Association of Amateur Radio’s (ARRL) annual Field Day Event, where thousands of amateur ham radio enthusiasts gather at different locations across the nation to test field preparedness and emergency communications abilities. Field Day is the largest on-the-air operation of the year and in 2010 contest logs were submitted by a record 2,648 clubs, groups and individuals across the United States and Canada to the ARRL Contest Branch. These logs showed participation by 37,764 individuals during the 24-hour event. 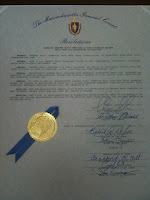 This weekend I will be at the Fuller School Field in Gloucester to present a legislative resolution honoring the event. To learn more about the ARRL or Field Day please click here to view the organization’s web page. To read the resolution in its entirety please click read more. COMMEMORATING AMATEUR RADIO WEEK AND HONORING AMATEUR RADIO OPERATORS AS THEY CELEBRATE FIELD DAY. RESOLVED, THAT A COPY OF THESE RESOLUTIONS BE TRANSMITTED FORTHWITH BY THE CLERK OF THE SENATE TO THE WESTERN AND EASTERN MASSACHUSETTS SECTIONS OF THE AMERICAN RADIO RELAY LEAGUE, THE NATIONAL ASSOCIATION FOR AMATEUR RADIO.